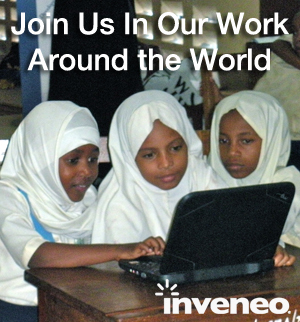 Inveneo is committed to bringing real economic and education opportunities to Haiti in 2011-2012 through the Haiti Rural Broadband Initiative, also known as the Haiti Connect Cities program, and its related efforts, launched in January 2011. HRBI is a collaborative program involving Haitian Internet Service Providers (ISPs), Haitian IT entrepreneurs and the many organizations – NGOs and otherwise – that will benefit from access to reliable and affordable broadband Internet. Inveneo engineers and our local partners have successfully completed Zones 1 – 5 of the network. This backbone comprised of hundreds of radios at 31 tower sites now provides a fully operational and stable network to connect 65 clients in these regions of Haiti. A total of 64 BATI have now been trained throughout six provinces of Haiti: Artibonite, Cap Haitien, West, South East, Central Plateau and Grand Anse. Inveneo handed off the day-to-day operations of the network to Haitian organizations in the first quarter, reaching a significant milestone. Inveneo established a framework by which BATI provide the first line of support followed by the Haitian telecommunications company Haicom and their team, who have taken over the Network Operations Center (NOC) responsibilities. On a daily basis, they monitor the ever-growing rural network while the ICIP Transversal handles every physical installation and all maintenance of the equipment across Haiti. 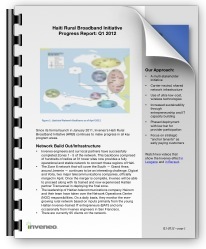 As of April 2012, the broadband network covers 20.72% of the Haitian population. In the case of NGOs, the increased efficiency [from broadband Internet connectivity through HRBI] drives development outcomes by allowing the organizations to better deliver their services through increasing beneficiary access, service quality and timeliness. One of the strongest assets of the model, the BATI training program, has led to a networked group of local IT entrepreneurs who have built their own businesses, acquired clients, hired employees, obtained ISP contracts, and enjoyed increased incomes. Customer acquisition is slower than anticipated. This is due to a number of factors, including: Complex processes within the ISPs to absorb the BATI; Speed of customer order process – organizations in rural Haiti need to work through multiple steps in order to get contracts signed by their country offices located in Port-au-Prince; Insufficient sales capabilities of the BATI themselves. We are currently seeking additional funding in order to conduct supplemental entrepreneurial, marketing and process training with the BATI to accelerate customer acquisition. Inveneo is currently developing a detailed proposal to share with potential funders. Inveneo is partnering with Microsoft, World Vision and HP to deliver 40 ICT labs in rural schools across the regions where the broadband network has been deployed. In Q1 of 2012, HCS added solar-powered computer labs to an additional six schools (19 in all) in four departments in Haiti: Artibonite, Central Plateau, Ouest and Nord. One school installation was completed with a new solar partner, Solar Electric Light Fund, a US-based non-profit. Also, 18 teachers were trained with the new basic curriculum and 5 with the advanced administrator curriculum. This is brings the total teachers trained to 98. The next phase of Haiti Connected Schools will bring rapid program expansion to more schools in rural Haiti now that processes, materials and qualified local resources are in place. Inveneo and NetHope received a grant from Intel to provide basic computer training in rural communities. Together, the two organizations will leverage the curricula, local trainers, train-the-trainer approach and computer labs implemented through HCS to offer training to new populations in the communities.